Years ago I used to buy odd tchotchkes from Seattle's Archie McPhee & Company catalog. In those pre-website days you would actually submit a printed form in a stamped, hand-delivered envelope accompanied by something called a personal check which was a voucher of sorts for funds to be transfered from your bank in exchange for goods. It was all very quaint. One of their adopted corporate icons was the charming and enigmatic Bibo the "god monster." On one of my order envelopes, in a sad grab for attention, I included a drawing of Bibo and was pleased when they printed it in one of their subsequent catalogs. I recently happened across the image posted on their blog after they discovered it in a stash of old customer envelope art. 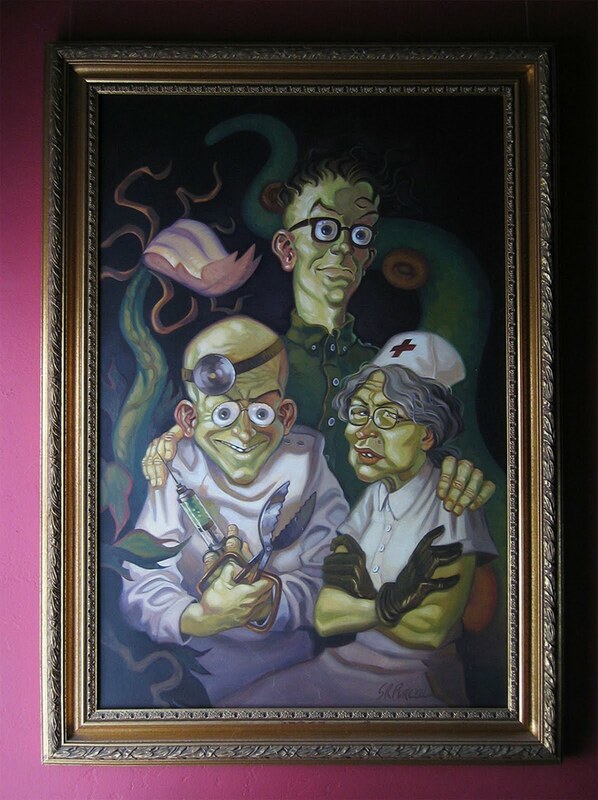 Here's a big oil painting of the Edison Family done long ago for a reissued edition of Lucasfilm Games' Maniac Mansion. The back of the box has a photo of an eerie haunted house-type hallway. 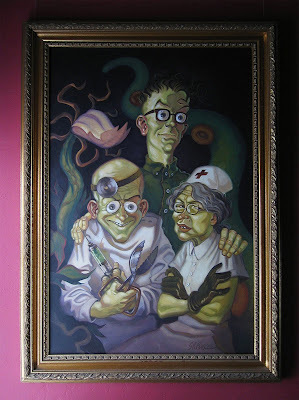 Originally I was commissioned to do a tiny painting to be hung in a constructed scale model hallway,... until someone realized it would cost more to create a scale hallway than it would to make a full-sized one. At that point the commission was revised to ask for a full size portrait. I thought of it as a Disney Haunted Mansion style piece and painted it in a weekend in oils with a few fairly large brushes.